Snowpiercer is having a few problems. Despite great reviews from film festivals, it’s currently stuck in a battle between Bong Joon-ho and The Weinstein Company, over whether a recut version should be released in the US and potentially other countries as well. The Weinsteins want to recut it, but Bong wants his version released. As a result it’s slightly stuck in limbo, so while it originally looked like it would be out next summer, there’s still no official US or UK release date set. However now a new Japanese trailer has arrived to give us a fresh feel for the movie. Snowpiercer is set on a ravaged Earth where the few human survivors are a train (which gives the film its name) that travels around the globe. However a revolution is brewing amongst the passengers inside. The film has a great cast, following Curtis (Chris Evans), Mason (Tilda Swinton), Gilliam (John Hurt), Wilford (Ed Harris), Namgoong Minsu (Kang-ho Song), Edgar (Jamie Bell), Tanya (Octavia Spencer), Andrew (Ewen Bremner) and Yona (Ah-sung Ko) as they ride the train. Snowpiercer marks Korean director Joon-ho Bong’s (The Host, Mother) English-language debut. The film is a dystopian sci-fi set on a ravaged Earth where the few human survivors are on the Snowpiercer, a train that travels around the globe. However a revolution is brewing amongst the passengers inside. Now a new trailer has dropped, which you can watch below. The film has a great cast, following Curtis (Chris Evans), Mason (Tilda Swinton), Gilliam (John Hurt), Wilford (Ed Harris), Namgoong Minsu (Kang-ho Song), Edgar (Jamie Bell), Tanya (Octavia Spencer), Andrew (Ewen Bremner) and Yona (Ah-sung Ko) as they ride the train. 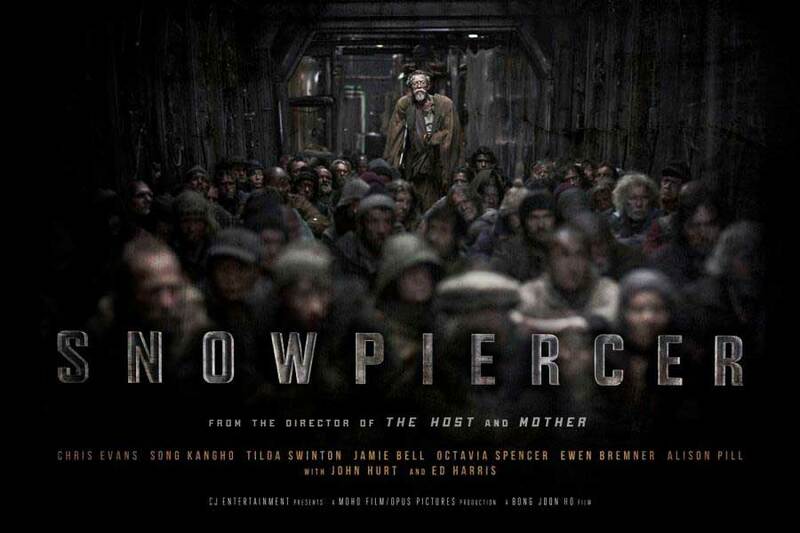 Snowpiercer marks Korean director Joon-ho Bong’s (The Host, Mother) English-language debut. The film is a dystopian sci-fi set on a ravaged Earth where the few human survivors are on the Snowpiercer, a train that travels around the globe. However a revolution is brewing amongst the passengers inside. The film will be out later this year. 2013 is the year of Korean helmers making their English language debut. We’ve already had The Good, the Bad, the Weird director Kim Ji-woon’s The Last Stand, and soon Oldboy’s Park Chan-wook will bring us Stoker. The third helmer coming from Asia to English-speaking realms is Bong Joon-ho, director of The Host and Mother. He’s made Snowpiercer, and now the first proper poster for the post-apocalyptic movie has debuted, via Twitch, which you can see above (click on it for a larger version). The film stars Chris Evans, Jamie Bell, Tilda Swinton, Song Kang-ho, John Hurt, Alison Pill, Octavia Spencer and Ewen Bremner. The movie is set in a world covered in snow and ice, with a group of characters stranded on a train dubbed the Snowpiercer, who all struggle to co-exist. Joon-ho Bong is directing from a script he co-wrote with Kelly Masterson (Before the Devil Knows You’re Dead), adapted from Benjamin Legrand and Jacuqes Lob’s graphic novel. No release date is currently set. Korean director director Joon-ho Bong made his name with the likes of The Host and Mother in his native country. Now he’s putting together his English-language debut, Snow Piercer, and he’s getting a very good cast to help. The latest to sign up, according to Variety, is Trainspotting’s Ewen Bremner, who joins Chris Evans, Tilda Swinton, Jamie Bell, John Hurt, Kang-ho Song and recent Oscar winner Octavia Spencer. The story is set in a world covered in snow and ice, with a group of characters stranded on a train dubbed the Snow Piercer, who all struggle to co-exist. Ewen Bremner will play a father who helps Chris Evans’ character find his kidnapped son. Joon-ho Bong is directing from a script he co-wrote with Kelly Masterson (Before the Devil Knows You’re Dead), with Chan-wook Park producing. It isn’t known when it will start shooting.